'Some of our consumer customers and some of our business customers have had multiple outages and we have to appraise them of their options'. One can write the usual sonorous letter to the Radio authorities but it saves a lot of bother just to telephone Radio New Zealand's helpline 0800KILLBUSINESSSPEAK whenever you hear a marketing CEO broadcast junk like that, and they promptly send round an operative to shoot him dead on the spot. - This has been found to be consistently more effective than the Plain English Campaign, and also saves buying a dictionary for all the businessmen who use big words like 'appraise' without knowing what they mean. Anyway there's a dictionary shortage. Not enough are being printed. Yesterday a truck pulled over in front of me and the driver climbed out and put his hand up to stop me. His understanding of the word 'dangerous' differed from mine: I think I was more in danger than dangerous. He was an ugly man. He looked like Rhodes Boyson. I should quite like to have had him shot for purely aesthetic reasons and never mind the fact that he was a road menace. But I thanked him politely. There isn't an 0800KILLATROCIOUSDRIVERS number but it probably doesn't matter. Frankly, if your eyesight is such that you struggle to differentiate between a person and the wayside pasture then lorry-driving isn't the best career choice because sooner or later you're going to be unable to differentiate between the road and a tree. However the immediate issue for me as a cyclist is that blindness and advanced stupidity don't prevent people from driving a truck. Given that the only sensible solution http://maxattainablespeed.blogspot.com/ isn't yet likely to engage public enthusiasm, perhaps I'd be more visible, if not safer, on my penny farthing. A worrying thing about penny farthings is that the front tyre isn't far from the backbone when resting, and every bump in the road, every pedal thrust, changes this gap backwards and forwards by a good 1.0295276 inches(1). I hadn't thought about this till the other day when Mr Knight pointed out that should the backbone momentarily make contact with the tyre it acts as the most powerful brake in the world, and if you're riding a penny down a hill and wisely standing on the step above the back wheel, you don't want to apply the front spoon brake because your momentum will bring the backbone forwards and it'll jam on the tyre, and then you really will be lofted up and over the handlebar to the consternation of all your neck bones. 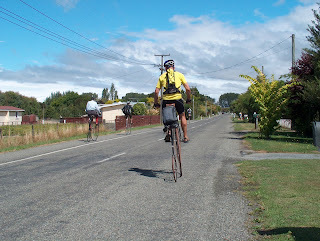 Watching penny farthings at speed brings home the variable wheelbase, and my spies report that at the next Waimate TT the penny farthing chaps propose another race presumably for this purpose. There has been talk of breaking the existing penny farthing records and Mr Knight has been consulted as to what they are (he knew instantly, muy bien) but he rather thinks they will not in fact be broken. I'm inclined to agree. I can't always manage those speeds on my recumbent.